Utility locating and subsurface surveys are performed before excavation, drilling and/or construction projects. 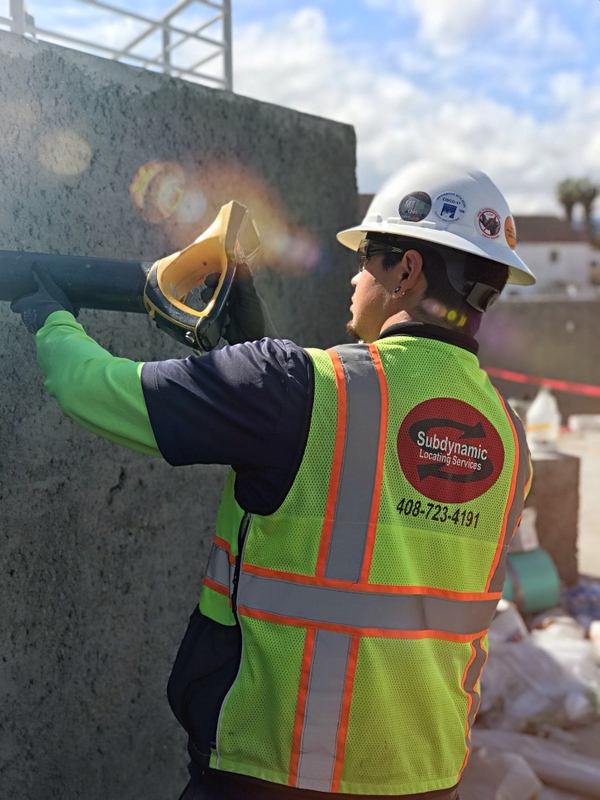 Our survey technicians use advanced instruments and methods to detect the location of underground utilities, piping and non natural occurring anomalies. The items detected are marked on the ground surface with paint or flagging. The location and depth of the items detected can be transferred to existing drawings or be surveyed in to a new drawing. There are three basic water leak detection methods utilized by our field technicians. The methods, standards and procedures are constantly customized to adhere to specific system characteristics. The three water leak detection methods are the Sonic Method, Tracer Gas Method and Correlator Method. The method to find a gas leak under the house is performed by evacuation of the gas from the pipe. Then the pipe is pressurized with helium. If we cannot see the pipes under the house through the crawl space, then we use a radio frequency pipe locator. The pipe is then surveyed with a helium detection instrument which detects the helium escaping from the leak. Water and fluid leak detection can be performed on virtually all underground piping systems from residential to large pipelines and distribution systems. The detection and pinpointing of leaks on piping systems provides fluid savings and prevents possible property damage due to erosion. The leaks detected are marked for repair which minimizes the time and cost of repairs. Leak surveys are performed by skilled technicians using advanced equipment and instrumentation. Helium, gas and vapor leak detection is a method used to detect and pinpoint leakage in gas and hazardous material piping systems. The helium is purged through the piping system replacing the gas or hazardous product. The helium escaping from a leak can then be detected above ground by a skilled technician using advanced detection instruments. The leaks detected are rated and marked for repair. The helium is an inert gas which can be mixed with virtually any product making it safe and simple to detect leaks in any difficult situation.